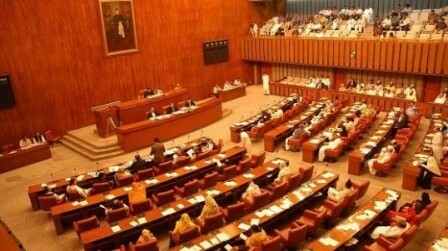 ISLAMABAD: The Senate resounded with desk thumping in approval of the 18th Amendment Bill being passed by the upper house, clearing the way for its implementation. Senate members raised slogans celebrating the landmark revival of the 1973 Constitution. Members of the Parliament praised the president for the passage of the 18th Amendment. – cancellation of the president’s power to dissolve the assemblies along with the removal of a bar on third time premiership. – despite protests and unrest in the Hazara region against renaming of the NWFP, the clause was approved by the House unanimously. – under the new amendments, the Election Commissioner will be appointed in consultation with the opposition leader. – the number of cabinet members would be 11 per cent of the total membership of Parliament. Later addressing the House, Prime Minister Yousaf Raza Gilani called it a historical day for Pakistan – one which saw all the democratic forces united on one platform. As brilliant as it all may otherwise seem (all the political parties coming together isn’t a frequent occurrence in this Land of the Pure) this is actually a sad day for democracy. If only the senators had the stones to do what their colleagues in the parliament couldn’t: vote against the clause that made them puppets in the hands of their Political Party Boss. A) Under the 18th Amendment, political parties are no longer required to mandatorily hold internal elections. How can a party that doesn’t know of or practice democracy on a small scale be expected to implement it when in power?? B) Parliamentarians and Senators alike, the Prime Minister included, can be removed from their assembly seat for any act seen as ‘violating party discipline,’ at the discretion of their party chief.